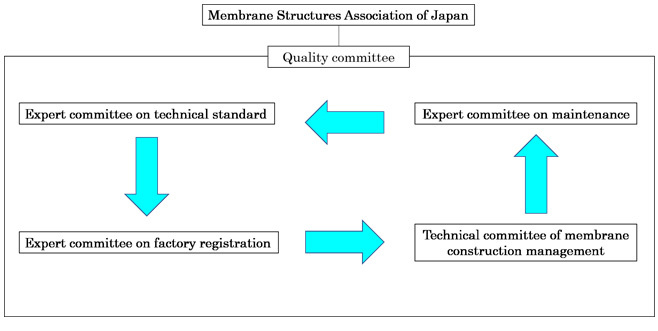 The Membrane Structures Association of Japan promotes its activities under the committee system shown below, in order to assure and improve the qualities of membrane structure buildings. In order to ensure and improve the quality of membrane structures, we establish following standards and guidelines as the technical standards for membrane structure buildings, membrane materials, and so on. We establish the membrane processing plant registration system that certifies the factories that are capable of producing membranes of proper quality for the membrane structures, in order to be used as a guide for the users to select a membrane manufacturer. This is a part of our comprehensive quality ensuring efforts. Considering the importance of maintaining/refurbishing of the membrane structure buildings, we establish the periodical inspection system for the membrane structures. At the same time, in order to maintain/foster the qualified engineers who conduct periodical inspection on the membrane structure buildings, we present training courses targeting professional engineers who have a certain experience and set up a registration system to register the engineers who pass the test. Since there are limited numbers of construction supervisors who have enough knowledge, the engineers who are in charge of managing the construction of membrane structures or tent warehouses are demanded to take a heavy responsibility and to have professional skills. In view of such circumstances, we present training courses targeting the engineers who have a certain level of experience, knowledge, and skills, and set up a registration system to register the engineers who pass the test (membrane construction management engineer registration system).